Nico brought a quite nifty tool to my attention today: VSPlus. 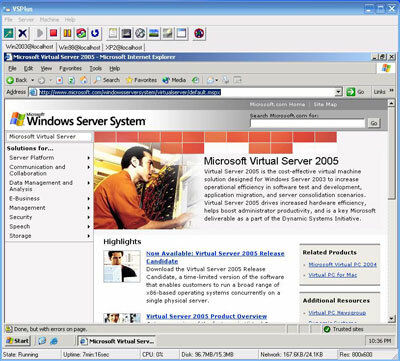 It’s an administration tool for Virtual Server which makes it a lot easier to administrate Virtual Server Virtual Machines. It’s the author who’s writing this. What’s wrong with you? What does the sourcecode have to do with the arguments you bring up? Nothing eh? You have to agree because the author wants you to agree in order to use his software – It’s his choice. If you don’t want to accept the disclaimer just don’t use it: Simple! So if you could enlighten us with some more specific questions – would be great. Well without the source, how can I make sure it “has not spyware, adware or malicious code”? How long would I have to “monitor” the app to make sure? 1 month? 2? 4 years? What if it has a routine that makes it send all its collected data after 4 years and 3 months? You can’t trust a program to be “secure” if you can’t look up what it is doing – in the source. what’s your problem monitoring it forever? It’s an automatic task to monitor software… it’s what your personal firewall (if you have one) does. Actually you don’t check every new version wether you have the sourcecode or not. Did you check the sourcecode of your opensource browser, your opensource kernel, your opensource tcp-stack your whatever-opensource program? Did you or did you not? You trust in it – time tells us that opensource is not a liability just by itself. When it comes to backdoors for example: Just remember the tcpdump/iptraf backdoors.